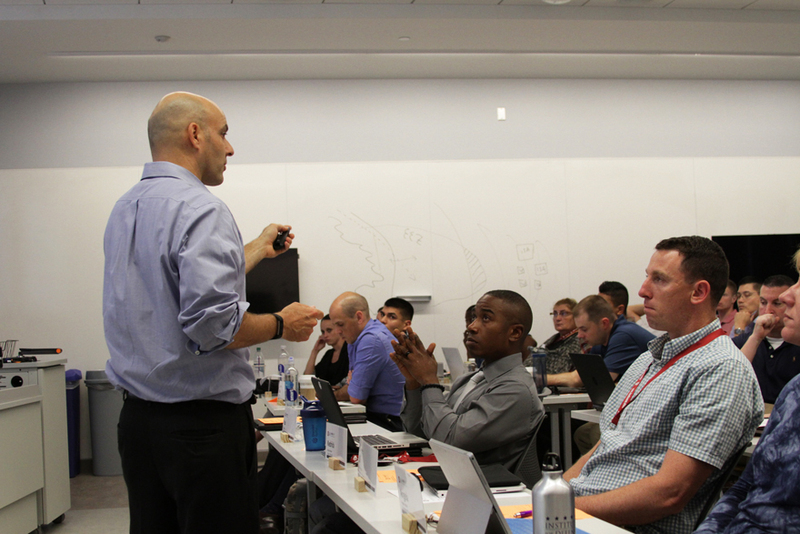 The team-taught class was part of a three-week graduate-level seminar for mid-level military officers stationed around the world. A partnership between the Institute for Defense and Business (IDB) and Indiana University’s School of Global and International Studies, the Kelley School of Business, and Maurer School of Law, the Strategic Studies Fellows Program comprises courses, simulations, and lectures by visiting experts and dignitaries designed to broaden officers’ perspectives on national security, strategic planning, and crisis management. Before embarking on their topic on this Wednesday morning halfway through the program, the professors paused to take the temperature of the room, in which 33 Army and Marine Corps officers – and one British army officer – were seated. 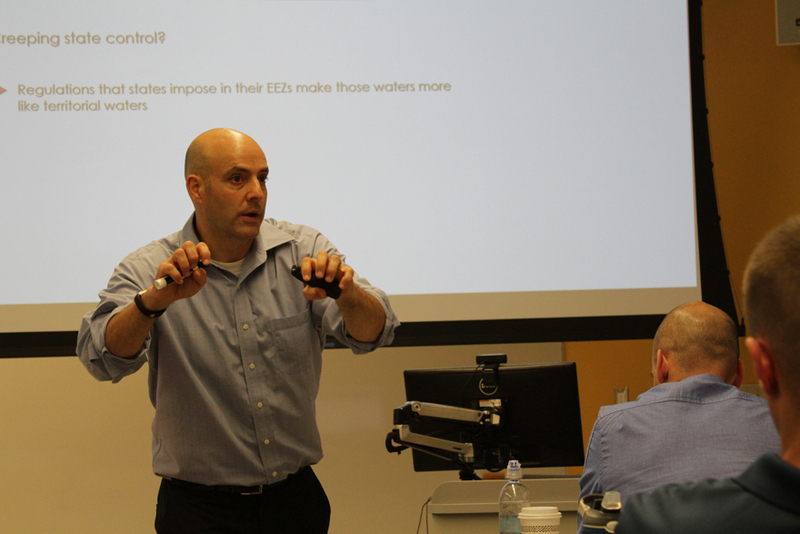 In addition to several classes being offered by Shackelford on the topic of cyber conflict and cybersecurity, Professor David Fidler had addressed “Law of Cyber War” earlier that week. A member of the IU Maurer School of Law faculty, Fidler joined colleagues from across the university providing instruction at the SSFP – among them, Brad Wheeler, IU Vice President for Information Technology & Chief Information Officer, SGIS Dean Lee Feinstein, SGIS Professor of Practice Congressman Lee Hamilton, and Ambassador Feisal Istrabadi, a faculty member in SGIS and the Maurer School of Law. Courses addressed broad global themes – such as “NGOs and Conflict,” (with Clémence Pinaud, assistant professor of International Studies at SGIS) and “Climate Change and International Security” (with Stephen Macekura, assistant professor of International Studies at SGIS) — and take “deep dives” into global hotspots, in such courses as “North Korea’s Nuclear Program (with Adam Liff, assistant professor of East Asian Languages and Cultures at SGIS) and “Russia and Its ‘Near Abroad’” (with associate professor of Political Science Dina Spechler). 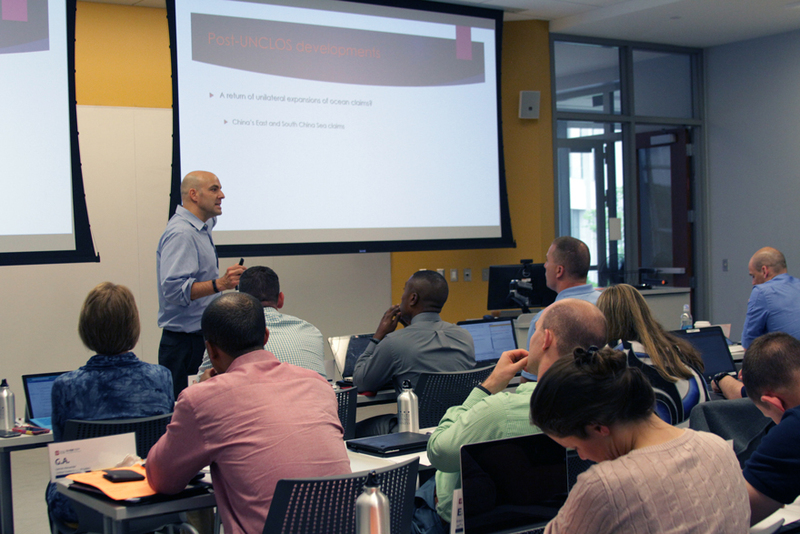 Hahn, who is a civil affairs team leader stationed in Ft. Bragg, North Carolina, explained why it is so crucial for officers to undergo training that broadens their perspective. She acknowledges that although new perspectives may be hard to incorporate on an institutional level, the nature of contemporary global challenges demands adaptability. “That’s what you want in your future leaders,” stated Hahn. After having worked as a group and received professional coaching, the students will present their capstone project to a joint IU-IDB and Army panel on June 2.